Last week I shared some information about the Washington Monument and the Pope's stone which was destroyed by the political party known as the Know Nothings. During my research I took a little side tour and found some interesting things about the panels that decorate the interior walls of the monument. In 1849, funds had begun to dwindle. 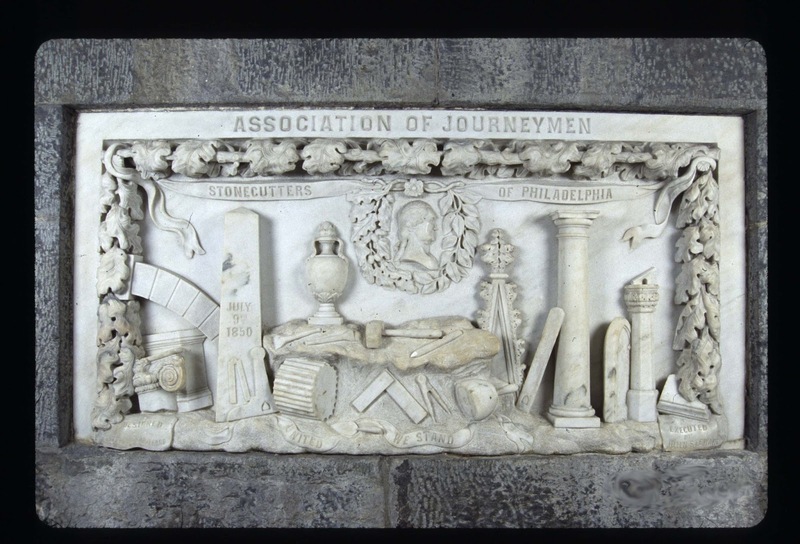 The Society began the commemorative stone program where states could donate engraved stones that would go on the interior of the monument. The program got a little out of hand as more folks got involved. Stones began arriving from territories, groups, organizations and even a few individuals. The purpose of the program was to help all Americans feel a part of the memorial and more importantly to the society the stone donation program would cut the cost regarding the number of stones to be purchased. So, I thought I would post some of the bits of information I found on 13 of the stones since it is Thursday, and it's been forever since I posted a Thursday 13. 1. The "Alaska" Stone was the last to be installed. It's made from jade and is said to be worth three million dollars. 2. The "Citizens of Stockton, California" stone is made from granite. The gold leaf on the letters dates back from the 1850s Gold Rush. 3. 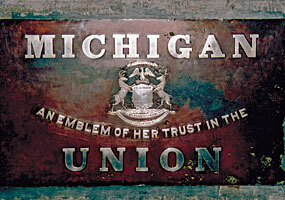 The "Michigan" stone is solid copper with a sterling coat of arms and lettering that costs around $1,000 in 1852. 4. The "Nashville" stone was carved by William Strickland, the architect of the state capitol in Tennessee and who is actually buried within the walls of that building. I'm glad he didn't make the same request for the Washington Monument. 5. The "Arizona" stone is actually fashioned from three different petrified tree trunks. Why? Well, Arizona is home to the Petrified Forest National Park. 6. The "South Carolina" stone was damaged during the Civil War when it was removed following Fort Sumter. A hatchet was used to remove the stone, and then it was buried on the monument grounds. During the war hundreds of Northern soldiers camped on it and farm animals lived over it. 7. The "Turkey" stone represents one from several countries who wanted to take part in honoring George Washington. Turkey was one of the first nations to establish trade with the United States. 8. 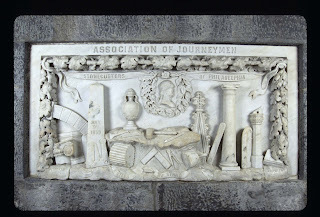 The "Association of Journeymen Stonecutters" stone is fashioned from Pennsylvania marble. It was designed by Stephen G. Cartlidge who was 17 at the time. 9. There are two stones from "Georgia". I find it a little ironic that one says "The Union as it was - The Constitution as it is" considering the Civil War was just a few short years away. 10. It should be noted that future generations might not know who you are if you aren't very clear. Seriously, who are the S. of T. R. I.? This stone was donated by the Sons of Temperance of Rhode Island. 11. One of the few stones given by Native American groups was the "Anacostia" stone. 12. I don't know about you, but there's just something about the "Kansas" stone I like. 13. 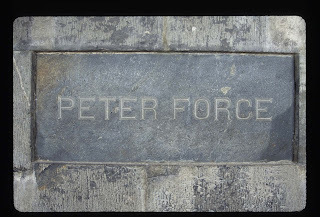 And last, but not least is this stone...the "Peter Force" stone. It was accepted by the Society before November 27, 1849....after that date they no longer accepted stones from individuals. You can look through all of the stones here. You can visit the Thursday 13 blog hub here. The stones are so much more expensive than I would think. I had no idea the Alaska stone was jade. I like the touch of gold from the gold rush. Thank you very much, EHT. i haven't been this pleasantly stoned in quite a while. Living on the other side of the world, monuments and great buildings of the USA are only glimpsed on screen - thank you for this snapshot, and for the link to the booklet which describes everything in more detail. SO much interesting information to read..... There is so much more to understand beyond just gazing at its shape against the sky. We were always told that the reason the brick is two different colors is that bottom stone was from quarries in Georgia but after the Civil War, they finished with stone from a Yankee quarry.